Last night amid a flurry of tweets and status updates, “The Girl and the Fox” went live on Vimeo and Youtube! We’re already off to a great start across the blogosphere, with mentions on Coldhardflash.com and Kuriositas.com. Our next big goal is to get featured on Short of the Week, and you can help us do that by voting for the film did a great job voting! We made it! Did you know we’re still showing in theaters, too? It’s true. We’ve got big appearances coming up at the Nantucket Film Festival at the end of this month and the Toronto Animation Arts Festival International in July. In fact, I believe that’s TGTF on the front page! Head on over to girlandthefox.com/festivals for the complete literary. Thanks again to everyone that helped create, promote and support the film. It means the world to this small studio. We hope we’ll mean something special to the world. That’s all for now! Check back on Monday bright and early for the big premiere!!! ‘Girl and the Fox’ Premieres Online June 4th! It’s the day we’ve all been waiting for! 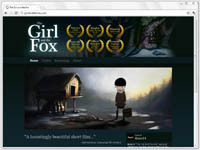 The online premiere of “The Girl and the Fox” has been set for June 4th, 2012. Look for it on Vimeo and YouTube. A lot is going into preparations for the online premiere. The entire film is being remastered in 32-bit color, animating and compositing are getting some touch-ups, and an entirely new musical score has been written just for this version! We’ll also be releasing some “Behind the Scenes” tutorials on YouTube to give fans a better idea of how the film was made. So mark your calendars! It’s going to be an exciting month! It’s a great month for residents of Northern California! We’ll be screening “The Girl and the Fox” five times over the next two weekends. First, at the San Joaquin Children’s Film Festival in Stockton, CA. They’ve made a lovely little page for our film on their website, where you can also buy tickets. We’ll be screening twice, on Sat. 21st and Sun. 22nd. The following weekend will be my next in-person appearance, at the San Francisco International Film Festival, the oldest continuously running film festival in the Americas. I’ll be there for three separate screenings of the film. The main event and official competition showing is on Sunday, April 29 at 12:00 PM, as part of The Storytellers Show. That’s the show anyone reading this should attend, if interested. But also exciting is two educational screenings for local school groups. I’ll be attending those and fielding questions provided by the kiddies, hoping to inspire at least a few young filmmakers in the process. So for anyone in the great NorCal region, please pay a visit! I’ll be giving out cupcakes, as always. Next Appearance: The LA Animation Festival! I’m also planning on being in town for the San Francisco International Film Festival in April. It’s been a while since I’ve visited the Bay Area so that should be a fun one, too! Watch Us Live At The Annie Awards! The show begins at 7pm PST, and if you’re a Base14 fan be sure to be prompt. I suspect the award for Best Short Subject will be one of the first presented. Excitement!!! Yesterday, the International Animated Film Society, ASIFA-Hollywood announced the nominees for the 39th Annual Annie Awards, the highest honor in the animation industry. Included on that list? “The Girl and the Fox.” Right beside all the best studios like Pixar, Walt Disney Animation, Warner Bros. and the National Film Board, Base14 stood proudly as a candidate for Best Short Subject. As a growing animation studio, this is undoubtedly the greatest honor we have ever received. The nomination alone is a stunning testament to our entire crew of talented artists, animators, musicians, sound engineers and producers. As director, I want to thank each and every one of them for making this vision a reality. I’ll be in LA for the Award Ceremony on Feb. 4th, and hopefully we can get a few of our other key crew members to attend as well. Finally, as a necessity to the film gaining a new place in the spotlight, I’ve launched the official website for “The Girl and the Fox”. For now it features a modest view of the tour schedule and trailer, but will grow as time goes on. We still have about a year’s worth of festivals on our tour schedule. Here’s to many more exciting days ahead of “The Girl and the Fox”!